Like I said from the start: moe + plot = POINTLESS! Moe is incapable of doing any of these options because the characters are designed to be pure, sweet and innocent (they can’t change). How can anyone do a normal A to B story with characters that has no motivation and the survival skills of a dodo? 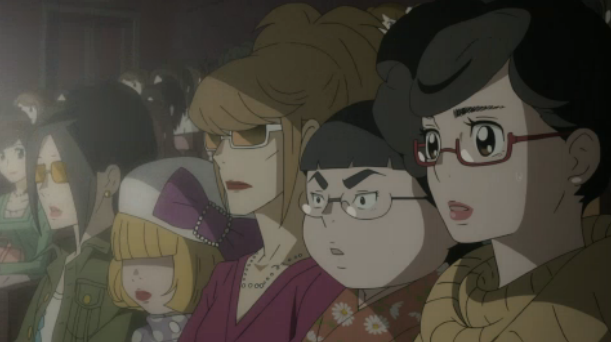 This show was fun to look at……….o-o I can’t think of anything ells? There were a lot of episodes that surprisingly rubbed me the wrong way? There was one episode where they were starving the bird in order to make him lose weight. I’m sure most of the people reading this know that starving yourself is incredibly dangerous (how do you thing I felt watching these characters play this for laughs?). I find that moe characters can be really terrifying when you realise they have the comprehension skills of a 2 year old (they could murder someone and see nothing of it). 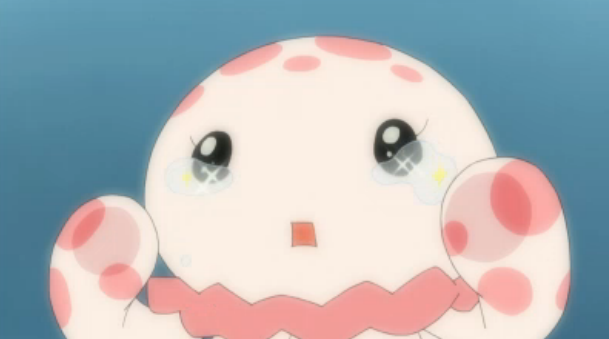 I can back that last statement with how Tamako reacts to everyone’s support. T_T . . . you’re an idiot. This was an interesting show in the sense it tried to do drama with moe but, inevitably you realise that in order to have interesting conflicts you need characters with character (Styrofoam has more personality then are main leads). 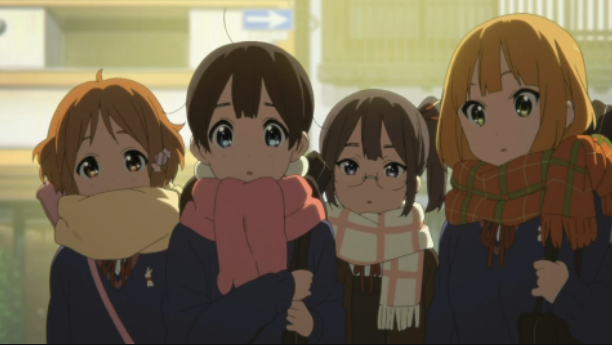 The tamako market ending reaction is going be posted Saturday because my body decided to hate me (need to eat better). ^_^ apparently I made one girl somewhere very happy! There was a woman who was desperately looking for a spike doll (my little pony) because it’s her daughters favorite character. shop owner: do you know the name of that dragon? me: it’s spike *blushes* I shouldn’t know that! shop owner: it’s ok! she was just wondering where to buy a plush version? me: you can get them at build a bear *blushes* I shouldn’t know that! The information was successfully passed on, which means a little girl somewhere will get to cuddle up with her favorite dragon. ^-^ I guess even pointless knowledge can be occasionally helpful. That was one of the most disappointing ending I have seen in a long time. What are they going to do with all those jellyfish dolls now that the building was randomly bought? Dose Kuranosuki ever find his mother? This is my biggest problem with this episode: Tsukimi is an illustrator, not a seamstress! This episode is demeaning to anyone who understands how hard it is to design well-balanced garments (it’s one thing to wear clothes but, it’s another thing to understand how they work). I truly believe that a girl who has no understand of shape, fabric or even different sewing techniques could win a professional fashion designer contest (The love of jellyfish can only take you so far). There are so many questions just left floating in the ether. This show really doesn’t know how to create tension. The biggest problem with this show is that it feels like it should be going somewhere, yet with each passing episodes we stay in the same place with the same bland characters. 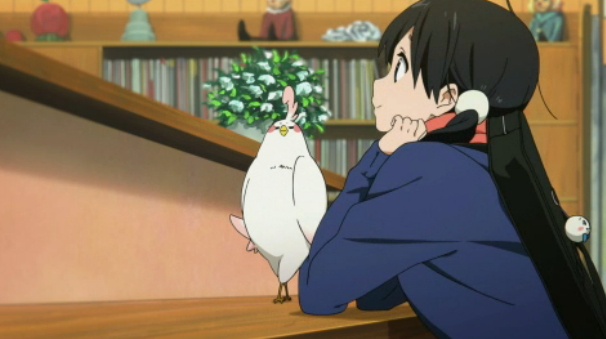 6 episodes in and I can only can remember 3 “characters” by sight: Tamako (she is the title character), that boy across the street, the bird and that flower shop woman (she has a man’s voice). I have a really hard time differentiating other “characters”. Episode 5 really confused me??? I can understand that some friends can be get very defensive when it comes to boys dating their closest friends (people don’t what to lose there friend to someone ells) however, she sort of comes off as a bit lesbian in this episode. I can kind of understand stopping a love confession being delivered by bird (even if it does sound romantic) but, when you start to ferociously keeping them apart, asking Tamako who she like best and even intimidating the boy (I haven known her longer and I know more about her then you) I have to ask the question, are you sexual attracted to this girl? At the end of the episode she just randomly becomes ok with it and moves on…..what? You can’t have that character be that defensive change their mind that quickly (you need a good reason for that to happen). It’s a cute show! I just wish it would stop doing forced conflicts. That little narrating jellyfish is really getting on my nerves. So are mighty transvestite has managed to gain the trust of the other girls who live in the dorm (Poor girls turn to stone so easily). There was a lot of trial and error but he has managed to give them more confidence and even more amazing, makeovers! His brother might look scary but I honestly wanted to cry after that woman made him think they did the deed. The poor guy is a virgin because of a traumatic experience that happened when he was little, the fact he is attracted Tsukimi is amazing. Tsukimi name sound like Zucchini in the dub *shrugs*. “Did you name me after a jellyfish?” XD I thought you were named after a vegetable. I hope this anime dose not ruin itself by having a dreadful second half (many anime that had good starts have destroyed themselves trying to make dramatic/over the top endings). I’m a rush to finish Princess jellyfish and Tamako market because I only have the ps3 for the this week only (I also have the big TV too myself). I’m having to write things down by hand (no need to have the computer on if i’m watching TV). This computer likes to glitch A LOT! The screen also has a loose plug (I’ts going to shock me if i’m not careful). Tamako is a young girl that lives with her father who owns a mochi shop that is in rivalry with another mocha shop across the street (that was a lot hard to say then you think). 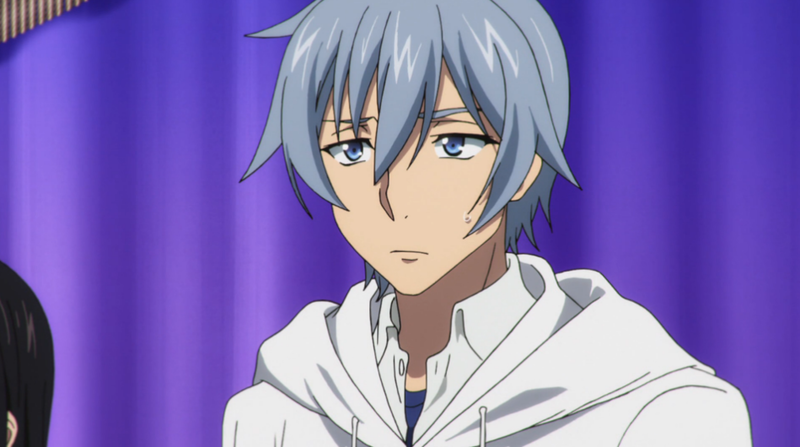 The rival mochi shop has a son that I think is going to be a romantic love interest at some point in this anime however, seeing as this is a moe based show I highly doubt he will ever brake though her dense head. There is nothing wrong with the show but…..I do think this first episode is very cluttered. 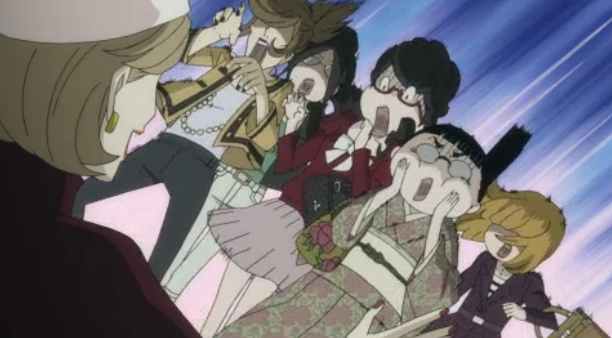 O_O I would love to talk more about this anime but there is just so little substance. They try and make it look like something is going on (hence the clutter) but underneath all that show none of it has any impact on the characters. 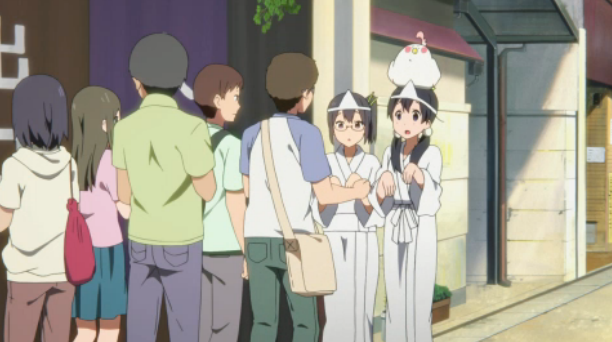 I don’t need 10 episode of Tamako moping about people forgetting her birthday, but I do expect something! Guy: it’s Tamako’s birthday and I forgot to give her a gift. If you are going to have a story in any show you need a beginning, middle and end. The show is about an illustrator who has a really bad obsession with jellyfish thanks to her mother telling describing the long tentacles as elegant wedding lace. This girl has always desired to be a beautiful princess but life has just not handed her the right saturation in order to boost her confidence (she need to see herself as attractive). The show is filled with odd ball humour that you just don’t see coming half of the time. The girls at the dorm all have the own presence that leaves you randomly guessing what they are going to do next (they look like archetypes but there not). I have always had a deep love for jellyfish so seeing an anime where someone is nerding out over them will always bring a smile to my face (same with mushrooms). I do wonder if it was produced by the same people who did penguindrum because the style choices / geist feels similar (a signature way of talking/portraying characters). This anime will always find a way of putting me to sleep. I think the show is just too wordy (dose’t hold my interest). I never understood why young children were allowed to sign up to a game where you live chat with hundreds of grown adults (just seems like you’re asking for trouble). I also find it odd that we don’t really see any high leveled child players in this game? Are main character apparently leveled up to max without group help (makes you wonder why he was still playing the game). This show consists of talking….and talking….explaining talking, if you can’t tell there is a lot of talking in this anime. You would think they balance out the talking with something visual interest but nope, we have sit down and listen to a group of people talking about world politics round a table (is there anything more exciting). The show likes to dump out game moves and groups almost every episode, there no way of remembering it all without writing it down. 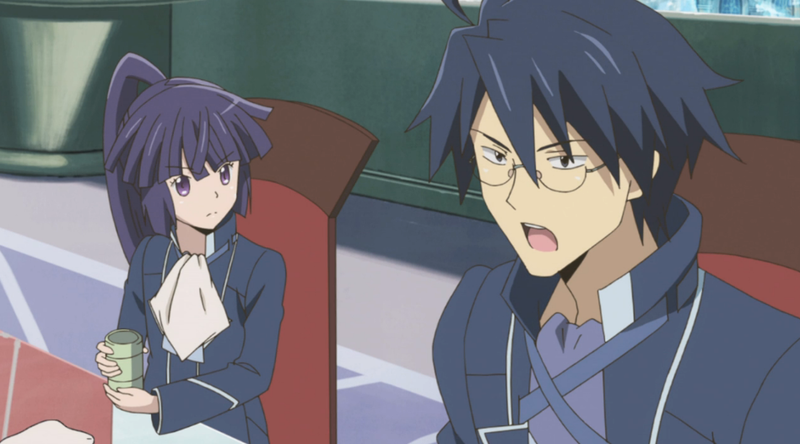 ^-o thanks to the two new members of log Horizon we now have an excuse for the boat load of game exposition (The main character used to announce it every episode). He used to confuse me when he started talking about game mechanics because he talks as if he is directing it towards someone…in his head. The show does have its fair amount of action/ daft moments, it’s only hindered by the fact that it won’t shut up (not every moment needs explaining). Each of the episodes can easily be viewed as singular entities thanks to the wide range of characters (I actual like the anime more for this reason). Usually when an anime has many characters we end up focusing ether too little or too much on the wrong characters (who want to sit down and listen to 12 episodes of characters stating pointless rubbish). The only downside is that because you are constantly bouncing from story to story you don’t really get much time to bond with the characters. They look cool and memorable in their own right but, I don’t feel like I know any of them outside of what they do and how they do it. 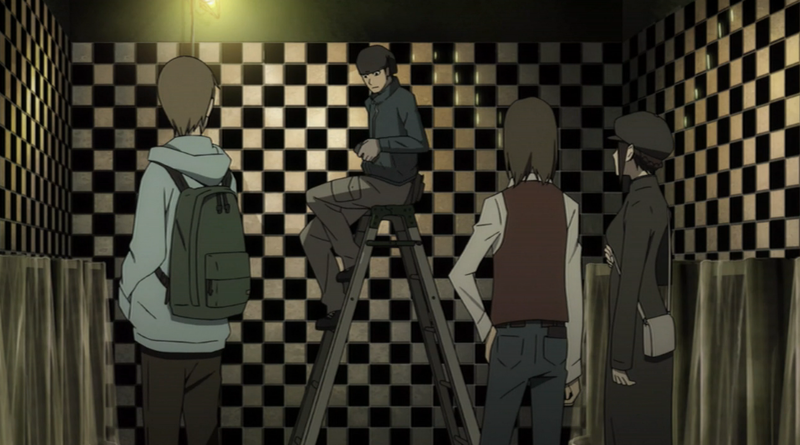 This anime uses its city backdrop to its advantage by making sure that all the crimes committed are (for the most part) believably realistic. I have fallen in love with the dark feel of this place you never know who is going to attack, kidnap or even deceive you (not many anime can do that). ^_^ I have not been this excited to watch an anime in long time.